An electronic reader device that scans text and reads back using optical character recognition. The device consists of a base (size of an A4 sheet of paper) and a scanning camera mounted above. Scanning is automatic when paper is placed on base and can be controlled without buttons by waving hand across camera. Powered by mains electricity, scanning is automatic when paper is placed on the base and can be controlled without buttons by waving your hand across the camera. Orientation of the page does not effect the reader. Can be used to read books, newspapers, magazines, labels etc. Eye-Pal: For use with people who are legally blind. Portable (weighs around 0.45kg and folds), PC required to use. Can convert printed material to refreshable Braille, speech or text file. 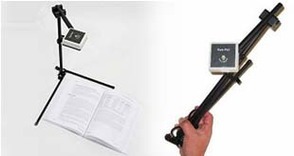 Eye-Pal SOLO: No PC required to use although it can also be connected to a computer monitor so words will be magnified and displayed while also being read aloud. For use with people who are legally blind. Weighs around 2.7kg. No installation of software required- can use straight out of the box. Eye-Pal SOLO LV: For use with people who are visually impaired. PC required (to use magnification capabilities). With a monitor connected, words will be magnified and wrapped on screen. Words can be read out aloud and highlighted as they are spoken. Can also save to a text file, Weighs 2.7kgs.